“Delicacy” is a multidisciplinary exhibition showcasing the work of five New England mixed media artists. Each artist explores ideas of intimacy, while delicately applied techniques resonate in the work. In addition to woven expressions of elegance, the work simultaneously asserts an undeniable vigor. One of many shared trends throughout the artists’ work is their inspiration for subject matter–the intimacy of their personal beliefs and histories. Another commonality is their attention to identity within society. The execution of delicate techniques are evident in the artists’ process and exploration of the picture plane. Whether the works are digital images, collage, drawings, or sculpture, each piece holds the essence of fragility and vulnerability. Todhunter began working on the latchkey kids series in 2014. The backbone of the series is an ongoing succession of plaster encased vintage dolls, each re-colored and re-named. The process of plastering and inking gives the originally identical doll forms new personalities. At Abigail Ogilvy Gallery, Stephanie Todhunter’s “Latchkey Kids” series continues with her solo exhibition “Stranger Danger.” Using vintage dolls, plaster, and inks, Todhunter captures the “lost-in-place” feeling of the 1970’s latchkey kids generation by accentuating their fading, unsettling, yet captivating features. The exhibition explores the construction of modern teenage identities with poignant, almost haunting reflections of the past. 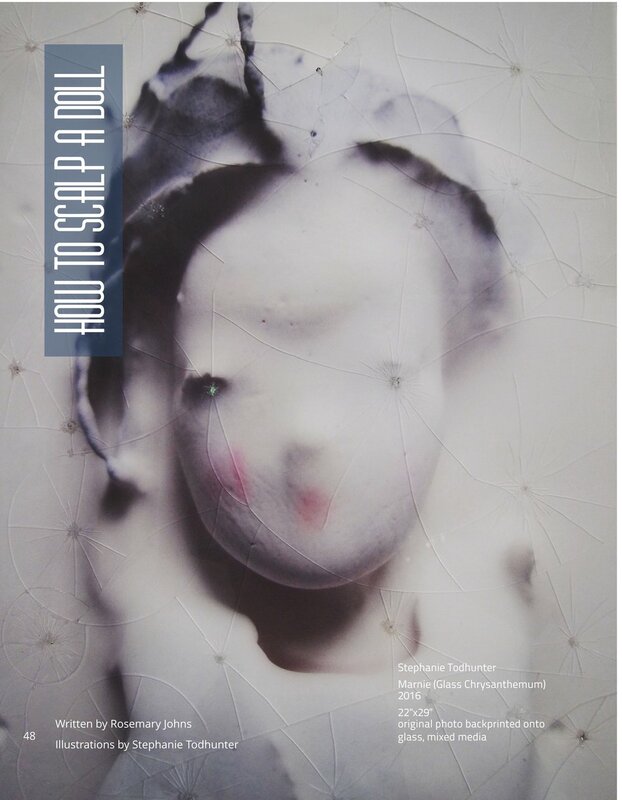 Todhunter toys with concepts of the young female body and its form by plastering the dolls to highlight their peculiarity, beauty, and unique personalities. Todhunter specifically uses vintage Dawn dolls from the 70s because “they were small, generic, easy to carry and easy to lose.” They act as trivial memorabilia which corroborate with notions of identities both lost and found. Naming and designing them individually, Todhunter gives the girls new personalities beyond their generic, manufactured forms. The exhibit begins with a series of girls encased with plaster in rectangle frames that resemble the display boxes they might have been originally sold in. Like specimen on display, the girls look into the gallery with a kind of dreamy longing. Todhunter recounts the stark reality of the latchkey kids stating that, “children in the late 70’s and early 80’s were the unfortunate victims of increasing divorce rates, isolation, and lack of parental responsibility.” While her “lost girls” embody the unnamed youth of yesteryear, there is still something very contemporary about her work. The youth of today are faced with a different kind of isolation as constant stimulation, internet access, and helicopter parenting leaves little room for kids to be kids. To the left of the plaster dolls, a series of enlarged, mixed media prints dominate the wall. Here, Todhunter’s work is metamorphosed as a quartet of girls stand within constructed realities. She gives the girls a grander narrative as their plaster bodies enter the scenes of a Pan-Man user, a trespass warning, and an abandoned neighborhood. Saturated, altered, and ominous, these pieces further illustrate the distorted formation of self. Displayed beside one another, they explore dialectical tensions between real and contrived, pressure and fate. In “Nell Stranger Danger” the girl is faced with unfamiliar simulacra, yet she appears to be unaffected by and indifferent to her surroundings. The tenebrous, lurking girls appear to be isolated from their neon backgrounds, floating through simulatory worlds where they are forced to develop into womanhood alone. “Stranger Danger” is on view through February 28th at Abigail Ogilvy Gallery. Opening reception: Friday, February 2, 5 – 8 p.m.
Abigail Ogilvy Gallery is proud to present Stranger Danger, a solo exhibition by Stephanie Todhunter. Todhunter began working on the latchkey kids series in 2014. The backbone of the series is an ongoing succession of plaster encased vintage dolls, each re- colored and re-named. The process of plastering and inking gives the originally identical doll forms new personalities. 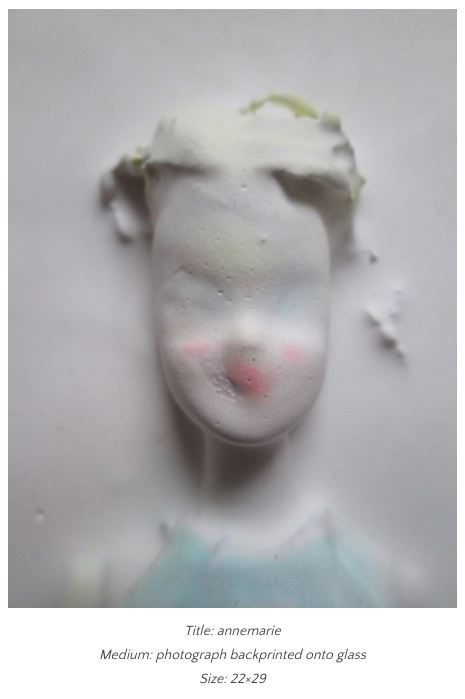 Todhunter takes photographic portraits of these found lost girls, and uses the images in larger mixed media pieces- trying to refine their identities further. She uses this exploration of their individual stories to reflect on growing up in the late 70's and early 80's- a period of increasing divorce rates, isolation, and lack of parental responsibility. The plaster encased girls (reminiscent of Han Solo encased in carbonite) start as vintage Dawn dolls from the 1970s. These dolls were only made for a brief amount of time and generally only remembered by the GenX demographic. Dawn dolls are smaller than Barbies and, although they have exaggerated, waspish waists and perky breasts, are “tweenish” in age. They were small, generic, easy to carry and easy to lose. Once the dolls have been plastered and inked, they develop distinct and often unsettling features and personalities. The photographic portraits Todhunter takes of each girl capture and highlight these quirks. The artist then gives each girl her own generation-and- personality-appropriate name. Her larger artworks use these same images as means to create a narrative about the lost girls. Common themes are isolation, stranger danger, missing children, parental neglect, and lord-of-the-flies-like adventure in small town suburbia. Todhunter intentionally contrasts these themes with those found in contemporary parenting: constant stimulation of the internet, helicopter parenting, snowflake children, online bullying- all of which are creating a new form of isolation among children today. Stephanie Todhunter grew up in the late 70s/early 80s in the Midwest, and was moved from small town to small town by her single, working mother. Immediacy and experimentation are essential to her multidisciplinary practice. Todhunter's work has been included in group exhibitions and featured in solo shows across New England, and is held in private collections around the world. 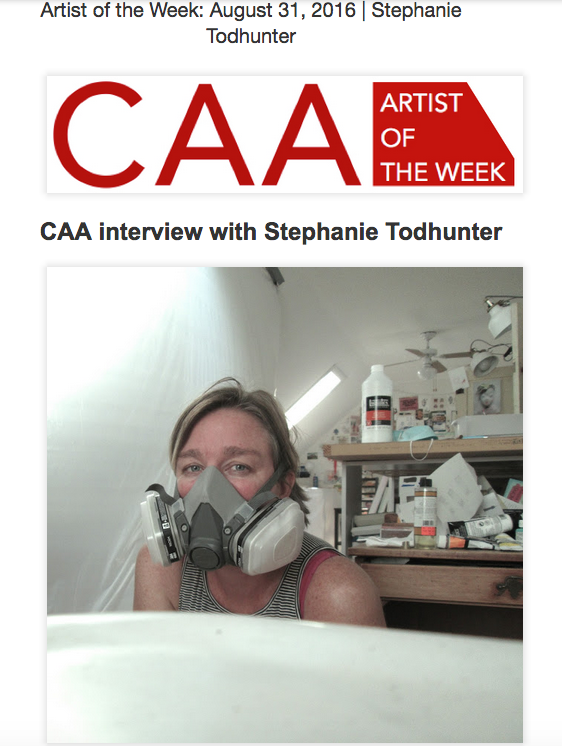 Most recently, Stephanie was awarded the 2017 Artist of the Year by the Cambridge Art Association, and her work was the front-cover feature of the March/April 2017 issue of Artscope. She is lives and works outside of Boston, MA. 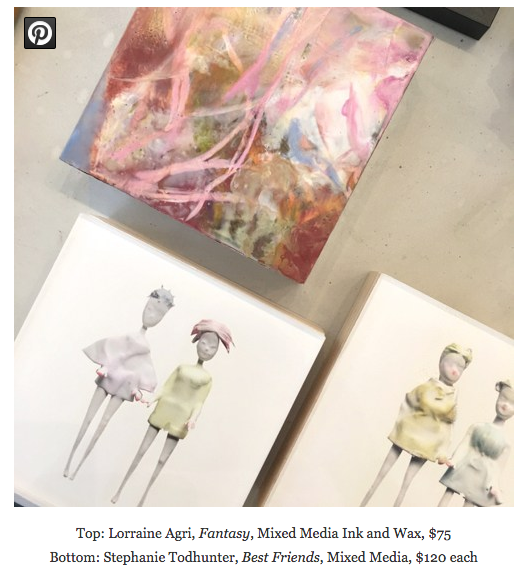 Gallery 263 is pleased to present latchkey kids, a Curatorial Proposal Series exhibition featuring a new series of mixed media works by Stephanie Todhunter. Twenty plaster-encased, hand-colored, 70s-era Dawn dolls form the backbone of the show. Macro-photographic portraits capture these frozen girls, their faces then printed on canvas and glass and buried underneath layers of metal leaf, spray paint, paper and wax. Some of the girls are shiny and brittle, others are bleached and torn. With these girls in latchkey kids, Todhunter gives voice to “generation x”; described as one of the least parented, least nurtured generations in recent U.S. History. Latchkey kids were identified by the house keys worn around their necks; a stigmatizing symbol for both their peers and teachers. Growing up in the late 70’s and early 80’s – in an atmosphere of escalating Cold War tension, high crime, environmental disasters resulting from corporate negligence, Satanic Panic, record divorce rates and increased child disappearances – these children were simultaneously self reliant and completely subject to the vagaries of the adults around them. This independence, combined with unstructured free time, resulted in invisibility; manifested in Todhunter’s portraits by blurred features and obscured identities. In an era before cell-phones and computers, and prior to after-school programs and extracurricular activities, network television served as the “electronic babysitter” and surrogate parent. Like the flickering TV sets they watched late into the night, Todhunter’s girls shimmer behind screens of smoke and glass — a radioactive landscape. We invite you to join us for an artist talk on Thursday, August 25th at 6pm, where Todhunter will briefly discuss her work and how it relates to themes of isolation, parenting and next-generation feminism. Currently a Boston based artist, Stephanie grew up in the Midwest, the child of a single working mother who frequently moved from small town to small town throughout the 1970s. 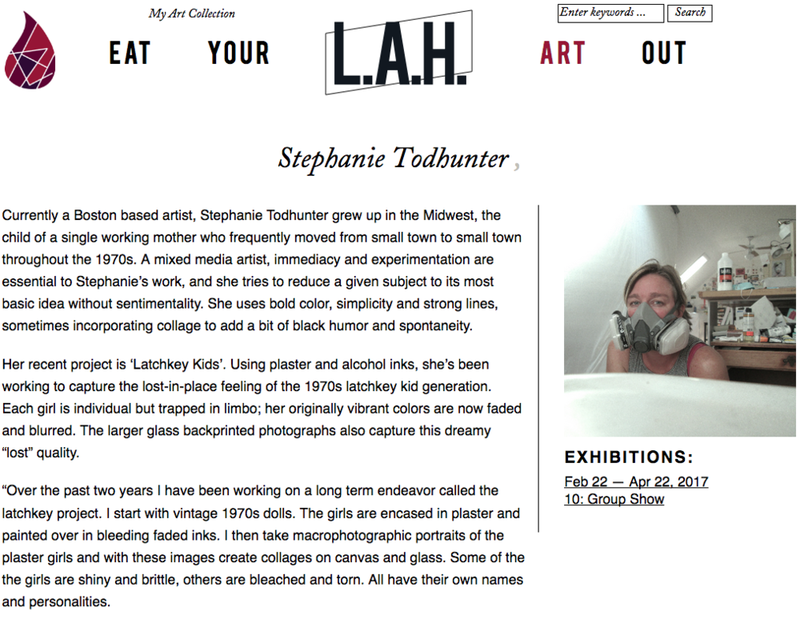 As a mixed media artist, immediacy and experimentation are essential to Stephanie’s work. She aims to reduce her subjects to their most basic idea without sentimentality. Recent exhibitions include Danforth Art Annual 2016 Juried Exhibition, Danforth Museum, Framingham MA; Heat Bromfield Gallery, Boston MA; Residual Form, Nave Annex Gallery, Somerville MA.